Chocolate and confectionery workers in the southeastern Turkish city of Gaziantep have launched a resistance in front of their factory since they could not receive their wages for 2.5 months. 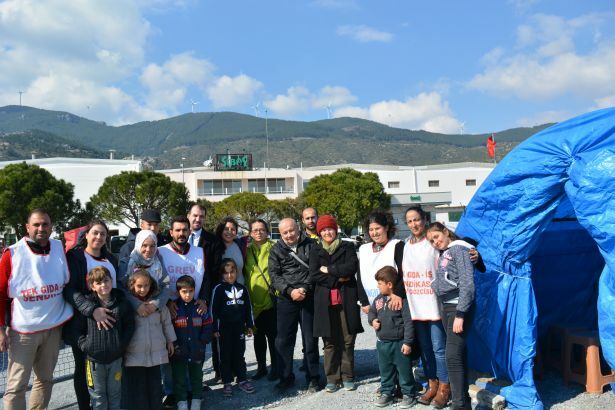 Working at an organized industrial zone for a chocolate company, Zümrüt Gıda, the workers started their resistance four days ago because their employers have not made any payments for around 75 days. The workers state that they will not terminate their resistance in front of the factory until they receive their wages and dues. “We cannot feed our families for months. We cannot afford to buy anything our children want. The boss and his children are all rich, they never experience what we live,” a resisting worker told soL news. The workers also added that the employers threatened them, telling the workers that he will never pay their wages since their resistance had now covered by the media and this coverage is “against the employer’s prestige”. The Communist Party of Turkey (TKP) members and Suat Ayaz, the mayoral candidate of the communist party in the city of Gaziantep, paid a solidarity visit to the resisting workers. Ayaz announced that they would stand together with the workers until they could receive their dues. TKP members and mayoral candidates also visited a group of resisting workers in the western Turkish city of Aydın. Working for a food company in the region, the workers had been dismissed because of their membership to a trade union. The workers say that they will continue to strike in their tents until they ensure their occupational rights.